I have Horde and Ally chars, so I think to do them both at the same time. Activated on both side at least 1 char go for the start quests and start the garrison. Off course I go level my Hordes faster and earlier then my alliance. I am not sure if it generate his "wood" automatic if you are not on-line with any off both chars. So I will find out later. Material is the currency for Garrisons, the new feature implemented in Warlords of Draenor. You get one Material every ten minutes, and it can also be a reward from quests, a drop from rare mobs, or found in treasure chests or events around the world. Everything in the Garrison costs Material. Building new buildings does, of course, but so does sending out your Followers on missions. This currency is used in the construction of your Garrison buildings. Resources are generated at a steady pace, with more generated when you have certain buildings (the Mill). Certain quests and "bounty" quests reward you with Resources. Follower's Successful Missions can reward you with Resources. Rare mobs can drop Items that give you Resources, and some drop the Resources themselves. TI style jumping games can have a chest reward with Resources. Resources can be looted from objects on the ground. - Found a Lunarfall Egg object (5-10 garrison materials) in the phase before you build your garrison. This is in the big nest that the Lunarfall Matriarch is guarding. This is not available after your garrison is built. - Follow the pug Pippers it will lead you to at least 4 different dirt piles containing 10 resources each. - Underneath the boat you crashed on after escaping Tanaan Jungle intro event is a Sunken Treasure containing 10 materials. - In the Paletide Den is Stolen treasure containing 10 materials. Paletide Den is across the water from the crashed boat you arrived on. The rare Bahameye is in the water between this cave and the boat. - also at Eventide Landing is a barrel of Fantastic Fish contains 10 materials. - Rotting Basket inside Bloodthorn Cave next to the npc Diaani whom you rescue for a quest. Contains 16 materials and a battered wolfskull helm. - inside Waning Crescent cave is a Glowing Cave Mushroom (look for the waterfall inside the cave) Contained 10 chameleon lotus and 15 materials. - find your way onto the top of the entrance to Waning Crescent cave, you'll find Treasure: Hanging Satchel first time I looted it it had 19 matierals, second time 12. - Gloomshade Grove Treasure: Sunken Fishing Boat contained 19 materials and 5 parasitic starfish 10 awesomefish. - in a hut in the north west corner of Anguish Fortress is a Shadowmoon Treasure chest, had 58 garrison resources when I looted it. - Anguish Fortress Treasure: Uzko's Knickknacks in an alcove in the room directly opposite Essence of Anguish's cave. - Anguish Fortress Treasure: Rovo's Dagger in an alcove in the room right next to Essence of Anguish's cave. - Anguish Fortress Treasure: Beloved's Offering in an alcove in the room next to Uzko's above. - Anguish Fortress Treasure: Ashes of A'kumbo in an alcove in the room next to Rovo's above. - Anguish Fortress Treasure: Greka's Urn in an alcove in the room next to the ashes one above. - Iron Horde Cargo Shipment in a busted wagon on the edge of the Burial Fields on the Shaz'gul side. - Darktide Roost on the smallest of the 3 islands now inside cave of the middle sized island that make up this lvl 100 subzone is a Scaly Rylak Egg (might be the Treasure: Rylak Egg) with had an Aged Yolk inside and 25 resources. Will try turn these comments into a guide later (can't submit a work in progress). Much easier to use the in-game treasure maps sold for 100g each by Grakis and whatever the horde counterpart is in Ashran. - Treasure: Jug of Aged Ironwine in a cave Drax's Workshop (horde shredder quest destination) east of Frostwolf Overlook at the bottom of the series of waterfalls that flow into the sea. - Treasure: Farmer's Bounty high above Kuuro's Claim Been moved to Aarko's Estate. - Treasure: Keluu's Belongings under the bridge at Aruuna. - Treasure: Relic of Aruuna on the balcony of a small building overlooking the burning field to the south. Contains tiny naaru statue. - Iron Scout a lvl 95 male orc corpse lying in front of a burning tent, slightly north west from the small lake near Aruuna, has a chat option "search the body" that gives garrison resources (currently bugged, the chat option can be selected over and over). - Treasure: Aruuna Mining Cart or Treasure: Aruuna Mining Cart inside Aruuna Mines on the bottom floor. Contains some ore.
- lightbearer leaning against a tree in a clearing close to the arakoa flight master on Duskfall Island. - Duskfall Island, near the pleasurebot-8000 there's a barrel of fish on the docks with some more parasitic starfish garrison resources. - Vignette: Yuuri's Gift shows up at Exarch's Refuge next to the road west of Telmor after you take Yuuri's quest from him inside Tomb of Lights. He also shows up with another Yuuri's Gift at Court of Souls. - Treasure: Webbed Sac inside the cave at Deathweb Hollow (inside and up the ramp). - Treasure: Rusted Lockbox inside the cave at Deathweb Hollow. Go inside the cave and dive deep into the water on the left side. - Aarko's Family Treasure, on the coast south west from Telmor. Talk to Aarko to begin a small invasion event. Contains aarko's crosbow. - Treasure: Bonechewer Remnants inside the biggest hut at Gul'rok. - Viperlash, a rare in a cave at Gul'rok has a lootable spear sticking out his corpse after you kill him. For anyone interested in searching for all the garrison caches, hidden treasures and rare spawns around Draenor, I highly recommend the addon HandyNotes and its plugin DraenorTreasures. Update: 6.2 - Tanaan Jungle: Finally, we're able to grind Garrison Resources infinitely from the non-treasure containers mostly at around Aktar's Post in Tanaan Jungle. Those shards contain 15-50 resources each and they respawn quite frequently so we can farm them as long as we want. Unlocking Tanaan Jungle for the farmer character is not needed, it's free to fly there and farm. You can learn more about those container types in my guide here. Amethyl Crystal can be looted from Amethyl Crystal in Talador. Grants 100. Surplus Auchenai Weaponry can be looted from Draenei Weapons in Talador. Grants 100. Exploratron 2000 Spare Parts can be looted from Explorer Canister in Gorgrond. Grants 50. Iron Horde Weapon Cache can be looted from Weapons Cache in Gorgrond. Grants 100. Toxicfang Venom can be looted from Toxicfang Venom in Spires of Arak. Grants 100. Shadowmoon Astrologer's Almanac can be looted from Shadowmoon Exile Treasure in Shadowmoon Valley. Grants 25. Recipe: Fiona's Remedy can be obtained by completing Fiona's short questline in Shadowmoon Valley. Grants 25. Giant Kaliri Egg can be looted from Kaliri Egg in Shadowmoon Valley. Grants 25. Icemother Milk can be looted from Canyon Icemother in Frostfire Ridge. Grants 25. Pile of Frostfire Turnips can be looted from Goren Leftovers in Frostfire Ridge. Grants 25. Magnaron Heart can be looted from either Valkor or Vrok the Ancient in Forstfire Rige. Grants 100. //Note the drop chance is low. Also one chance per day per character. On an end note, don't forget to loot your Garrison Cache pile next to your town hall from time to time, the rate of the cache is tend to be 1 resource per every 10 min. If you're unfamiliar with the locations of all those rare spawns and treasures around Draenor, make sure you buy and learn the zone Treasure Maps from the Archaeology vendors in Ashran: Grakis for the Alliance and Srikka for the Horde and check Perc's relevant guide. Any confirmation of some beta comments like "the town hall generates 1 garrison resource every 10 minutes" and "the maximum amount of resources in the Garrison Cache from the town hall is 500"? Also, does upgrading your garrison to Tier 2 or Tier 3 increase how many resources are generated from the town hall? Most people know about logging their 90 alts out in an inn or a city so when they get to them they can have rested XP for two levels. However if you can just get through the Draenor Starting area to your first garrison on your alt(s), not only will you be accumulating rested XP, but you will be accumulating garrison resources in the cache! Remember to log in to your alt from time to time - you can only have 500 cap in the cache itself, but 10,000 on your character. And when you finally use your alt, you'll be able to buy a fair few Excess Potion of Accelerated Learning with the garrison resources. Best helper to gather Garrison Resources from around the world is Handynotes. The challenge with resources is that Blizzard starts you off giving you tons of resources from almost anything. Bend at the middle? Have some resources! The further you level, the less opportunity you have to get resources and you need to rely on other avenues. By the time you're 100, there's almost no way to get resources outside of a few sources. This leads many to a false sense of security as your first introduction to garrisons is paired with a generous influx of resources. By the time your realize the spice isn't going to flow forever, you've already burned through most of your stockpile. The only real solution until Blizzard provides more venues for getting resources at end game, is to just not spend much at all UNTIL endgame and after you pay for your level 3 garrison. FWIW, this is what I've done, and I have over 2K resources at level 97 (and not even started with Talador). The purpose of this approach is to maximize acquisition of resources at the greatest time you are acquiring those resources, and storing them against later needs. This is a "pre-endgame" approach and assumes you are looking to spend most of your time out in the world, leveling, running dungeons, etc and not delving deeply into garrisons early on. - Plan a basic, minimalist build: Barracks, Profession Building then Lumber Mill and Storage. Reasons: Barracks is free, matching profession building not a bad thing to have, storage: great to have your bank on-hand, Lumber Mill: right now the best, most efficient, predictable and controllable resource gain). - Do every quest to unlock the treasure maps. Kill every rare. - Only do follower missions where you have either: 100% chance or you have no choice but to send the follower off because the follower's level is too low in relation to the average number of missions being offered. Keep in mind a high-level follower with the right counter can "carry" low level followers. - Do not spend any garrison resources on anything other than the basic build and mandatory buildings. I was able to get: Level 2 Mine, Herb Garden, Fish Shack, Profession Building and Storage. I kept Lumber Mill and Barracks at level 1 with minimal impact to my garrison resource cache. - Get the Lumber Mill for Gorgrond. This gives you the shredder, which has limited flight and will allow you to quickly solve vertical puzzles in Gorgrond. The tangles of overgrowth are numerous and great resource sources. - When you are done with a zone, buy the treasure map. Then go back into the zone and clear out your treasures. I feel doing at the end of each zone is more effective: better chance of getting item drops that are meaningful for your level. Also, you're familiar with the zone, so getting around will be faster. Finally, 100 gold in small chunks is better on the gold pouch than buying 4-5 maps at once. However, if you don't care, waiting until 100 then roflstomping content is totally fine. - Keep the barracks for the time being. It's a free building. If you don't want to keep it, just don't upgrade it. Small buildings, totally up to you, but choose something you can deal with until you hit 100 and get the quest to build your level 3 garrison. - Don't upgrade anything if you're unsure. if you change your mind, or swap, your buildings reset to level 1. So if you upgrade your barracks, then change it to stables, then decide stables is not for you and put the barracks back, you will get a level 1 barracks and will have to re-level it. The gameplay choice is Lumber Mill or Trading Post. Trading Post is a good excess materials for garrison resources trade, but it's not predictable or consistent. The offer change from day to day, and there may be days the material being asked for is something you don't have. Lumber ALWAYS converts to resources, in a predictable rate of 20 resources every 4 hours. Since you can only carry 250 lumber at a time (across all bags), you won't see someone monopolizing lumber or power farming it. If you don't want to commit to the mill, there's no harm in keeping it level 1, but you'll be limited to the start zones and Gorgrond (and parts of other locations) for the bulk of your lumber. Again, this is JUST to get you to 2,000 resources. Once you get your level 3 garrison,how you wish to manage the buildings you want against the resource constraint you will have is totally up to you. That's why I recommend not upgrading anything you might change. Don't waste the resource. Now while you're leveling. Another point: you can get some great buffs by using alternate buildings in zones. For instance: I may have Trading Post in my garrison, but the Inn in Spires. Inn gives me a XP boost. I also plan to have Stables in Nagrand, but not in my garrison. The local buff is fine for my needs. I have autoloot on and I always grab any garrison resources before I can read the amount I am looting. They also do not appear in my chat log as looted currency. Anyone know an addon to fix this? Why doesn't this page mention the Trading Post? That's also a good source for Garrison Resources. You can trade mats you don't need for Garrison Resources. For those who do not want to use Handynotes and motivation to complete each zone's questlines, there's a vendor that sells treasure maps for each zones you've completed. These maps reveal all the hidden treasure spots that commonly contain garrison resources. Along crate of Archaeology fragments we all know about. It will take 3 days 11 hours and 20 minutes for your garrison cache to cap at 500 garrison resources. NOTE: The six dailies from the Stables Level 1 mount training quest can net you up to an extra 120 GR per day for a limited time (+100 GR for catching and training each beast). It takes a day or so to ramp up to the maximum amount, and is proved for about a week and a half till the mounts are trained (I believe a daily ends once you have the mount). As the mounts are account wide, I do not know if you can also do these dailies on alts. It's worth noting that the Stables can be a pretty solid way to earn quite a few resources very fast. Each of the capture/kill quests rewards 20-50 resources each and there are at least 6 of each. This little bit of math should come useful to some players. This also may be one of the easiest/fastest ways to accumulate garrison resources. Firstly you'll need a follower with the scavenger skill. While some people may think it means 200% total it doesnt. 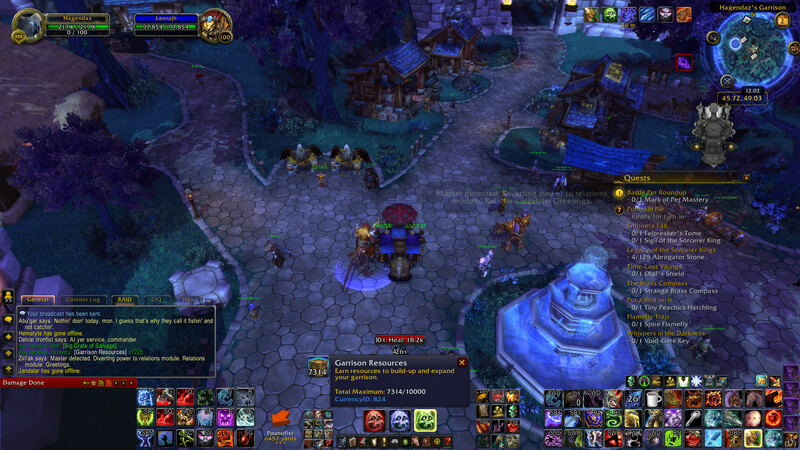 In fact it triples your garrison supplies rewarded from missons, and it STACKS. You have two garrison missions rewarding 40 garrison resources each. You can either have two followers (assume without the scavenger trait) that can counter the treats. You have two followers without the counter but they have the scavenger trait. You'll notice that the scavenger trait will likely pull ahead on average (susceptible to RNG). Also please keep in mind typically without the counter to the danger (at missions higher than 90) I typically have a 51-59% success rate. So the average mission being successful becomes higher than a 50% chance. Level 90 missions a lot of times gives my scavenger followers about a 78% success rate (without the counter to the mission threat). I've added a picture of what's possible by taking this chance with THREE followers with the scavenge ability. http://i.imgur.com/JAz5YVI.jpg The initial reward was 175 garrison resources I put three followers with scavenge on the mission and got 1225 resources from ONE mission. Math is as follows (3*2*175)+175=1225. I had a 40% success rate. Here is a detailed video of how you can get tons of resources. Probably more than you know what to do with! There really needs to be more ways to gather resources. 120~180 from full operating Lumber Mill and 144 daily is far from enough. Mission rewards are unreliable. Treasure Chests only give some 10 resources per chest, which is hardly worth the time invested running around the entire zone. We are forced into low-level quests only for the resources. There needs to be something better. Maps are a waste with the exception of frostfire and gorgrond. You might get 200 garrison from each if you are lucky, more likely 150. I am horde so I ran into shadowmoon valley and killed all rares and looted everything. I got about 700 just from that. I am on my 3rd toon. The first 2 are identical in garrison setup only happened because area52 at launch was terribad so I had an 85 on another server (low pop), 2nd account that I played while my main chilled and area52 got back to norm. Both have War/Lumber/tavern/tailor/ench/store all buildings have lvl100 followers assigned. I recruited scavengers after I quickly saw the advantage there, also epic mount is the other I recruit followers for. My garrison resources were easily managed on those 2 and when I spent they were quickly resupplied and I have about 4-5k each with maxed out garrisons minus the pets. Now my 3rd toon I have War Mill/Barn/tavern/salvage/forge/storehouse. I have followers assigned and a level 3 garrison but not all my buildings are. I have done all the treasures, rares you name it and I have 300 garrison pts. I am broke and hate this. I ran with the barn so as to get savage bloods but am at lvl 2 with that I do like the barn it's more fun so far than the lumber but idk. I dinged 12/19 on this guy so it's still early but I didn't have this issue with my other 2. My 4th toon going to try the trading post and barn cuz that guys a lw. One tip I do have for guys with multiple toons is to start the intro quests and get to your garrison, you will be close to dinging 91, (I kill all the rares close by and grab the 2-3 treasures in the same area while questing through and usually ding 91) and will get your garrison resources saved up before you start, 500 in 3.5 days (log in every 3rd day cuz 500 is max) so about 5k in a month which is more than perfect to start with. I have 11-90's yet to level so this will get super easy as I get to them, if I do. I just think that Blizz should have made the buildings work harder or faster as they level not just increase the work orders. I'm not saying a lot more but just more. Maybe instead of every 4 hrs it's 3hrs at lvl3, or increase workload output. example being tailoring 1 cloth every 4hrs can either be 2 cloth every 4hrs or 1 cloth every 3hrs. So the result is either 12 or 8 cloth in a day or 24/16 with a follower. But something has to increase in the garrison reward department. Definitely need to add like 50/100 lfr/norm/mythic and even boss loot. Last boss in heroics drops 25 once a day something. how to proc invasion get a group of friends farm one of the invasion factions each will get an invasion quest. only one person pick up the quest so you don't all complete the quest then go to each friends respective Garrison and compete the invasion with only that individuals quest active. Once complete, go to the next persons Garrison and rinse and repeat. Note: you can farm each of the invading faction kills to proc multiple quests instead of just 1 faction which makes farming very quick. Hope this helps and get some up votes to help others. If you are at the 10,000 cap and kill a mob that drops Garrison Resources, you will not be able to loot the resources but will get some mail from Thaumaturge Vashreen entitled "Lost Currency" that essentially says your total is still at 10,000; you do NOT get an item that you could use later to get the "extra" resources once you are not at the cap. For quests, you are still able to complete the quest; the game just appears to ignore the resources that would have been awarded had you not been at the cap. Excluding the times you would replace buildings and only build once, it costs a total of 10,650 Garrison Resources to build each building and the Garrison to Level 3. I haven't seen anyone post this prominently, so a cool strategy for spending these quickly at your trading post: You can run a simple command to buy tons of items like Draenic Dust. where the first number is the number item (Draenic Dust is third, so it's 3), and 200 is the amount. What no one seems to mention is that you can have the two buildings that produce garrison resources working orders for you at the same time, on the same plot spot. I have my inn, which I am not going to change, and on the other spot I have a trading post and I change it with the lumber mill. I make sure the Mill is full with Lumber(at L3), and change back to it once every 3 days (no resource cost, only some gold). It helps if you farmed a lot of lumber, now what they made lumber stack to 1000 and it no longer has a limit to how much you can carry. I collect about 800 extra garrison resources every 3 days with this method. This webpage needs updating for 6.1 patch. Why is there no "Currency for" tab on this page? To increase the base amount of Garrison Resources held within your Garrison Cache, please see: Trade Agreement: Arakkoa Outcasts. There are two instances of each type of cache, I'm assuming one for each faction. not sure when, but it looks like random daily heroic dungeons now give 200 garrison resources instead of the 50, now we talking! If only I could spend garrison resources to buy oil on my alts. I've got plenty on my main, but my alts are not as easily able to complete Tanaan stuff for oil. First daily heroic now award 200 Garrison Resources. then 50 for every heroic dungeon after that. Since alts usually have low ilevel gears, they are not good at fighting Tanaan mobs, so the best method to get Garrison Resources is to just pick up Radiating Apexis Shard at Throne of Kil'Jaeden. By realm hopping during off-peak hours, you are 90% sure to get at least 1 Radiating Apexis Shard every time you hop to a different realm, they give 20-50 Garrison Resources each, sometimes when I find a low-pop realm, I managed to get 5 Radiating Apexis Shard which gave me about 200 Resources. In less than 2 hours I got approximately 3000 Garrison Resources. You can also get Baleful armor/weapons from these shards(great for gearing alts) and also complete Unseen Influence by looting the shards. Any suggestions on what to do with excess resources? Is there maybe a way to turn it into gold at a reasonable rate? If you're new to Warlords of Draenor like me, do not spend those on something that can be bought on AH. The resources are vital for other stuff that cannot be bought, and there is always shortage of them. So don't exchange them until you are capped at 10k. So it's starting to look like Smuggled Sack of Gold is the best method to turn these into gold if you don't want to try dumping them as raw materials on the AH. Once missions stop rewarding gold in Legion, stopping by the garrison every few days for 500 GR --> 10x sacks --> ~150 gold doesn't sound like a bad deal, especially when you extend that to multiple alts. Assuming we get to keep our Garrison Hearthstone then it'll really fairly convenient to do so, but I guess that depends on what the same investment of time/effort gets us in terms of gold rewards in Legion. Check the Auction House for Huge Ogre Cache if you need like 1000 in a hurry. Earn resources to build-up and expand your garrison. Garrison Resources are also also needed for most Missions, Rush Orders to instantly complete Work Orders, Scouting Missives for Apexis Dailies, upgrading the Shipyard, and purchasing Shipyard equipment. For more details, check out Guide to Farming and Spending Garrison Resources.